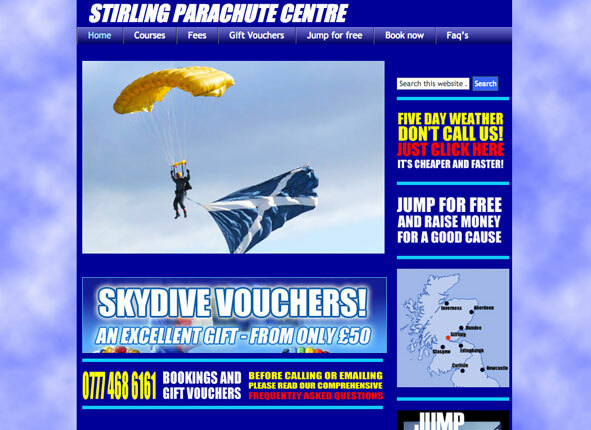 The Stirling Parachute Centre site has more of a focus on arranging charity skydives. The SEO aspects of these different services work well to keep the organisation busy! This website attracts prospective ‘Jump for Free’ and ‘Charity Skydive’ clients who then go on to make a Parachute jump (or buy a voucher online). It’s the sister site to the Skydive Strathallan website and most people who skydive in Scotland/northern England will have gone through one of these sites at some time. The site is responsive to mobiles and tablets and has a legacy Flash animation converted to work on modern browsers and mobiles.